The cover story from the of the New York Times Magazine this past weekend is entitled “The Future is Drying Up,” an excellent look at the work being done in the near term to cover the population explosion in the American West, as water resources become harder to allocate. It’s definitely worth a read, even if you don’t live in this region which is so dependent on water from so few sources. It’s also uncanny that this article came out just as the devastating wildfires in Southern California were growing out of control. With houses being built at a rapid pace in arid desert land areas, coupled with the drought scenarios described in the article – fire may shape the future of the region as much as water. This also reminded me of the excellent Long Now Seminar by Brian Fagan – “Catastrophic Drought is Coming Back”. His talk discusses how we’re not the first to experience these conditions (and far worse – such as 100 years of drought), and puts all of this in to a Long Now context. Of course there is a more immediate Long Now impact – the issues that Pat Mulroy deals with for Las Vegas water have reached all the way up to 250 miles north to Spring Valley where the Long Now property is. 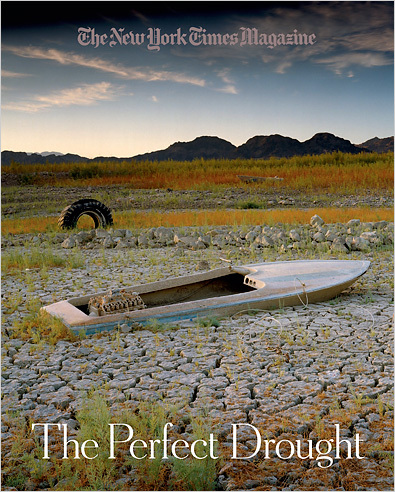 No blog post about water in the region would be complete without a mention of the great book by Marc Reisner, Cadillac Desert: The American West and Its Disappearing Water. It’s a must-read for anyone interested in the recent history and uncertain future of water resources in the Western United States.